I’m 11 years deep in the beauty game, so yes — I’ve been approached a few times to curate a beauty/hair/lifestyle subscription box. I’ve held out or it hasn’t worked out, so many reasons in the past why it wasn’t the right time or the right fit. Then I was approached by the creator of GeenieBox . Are you familiar? Let me tell you a bit about GeenieBox! And the concept? 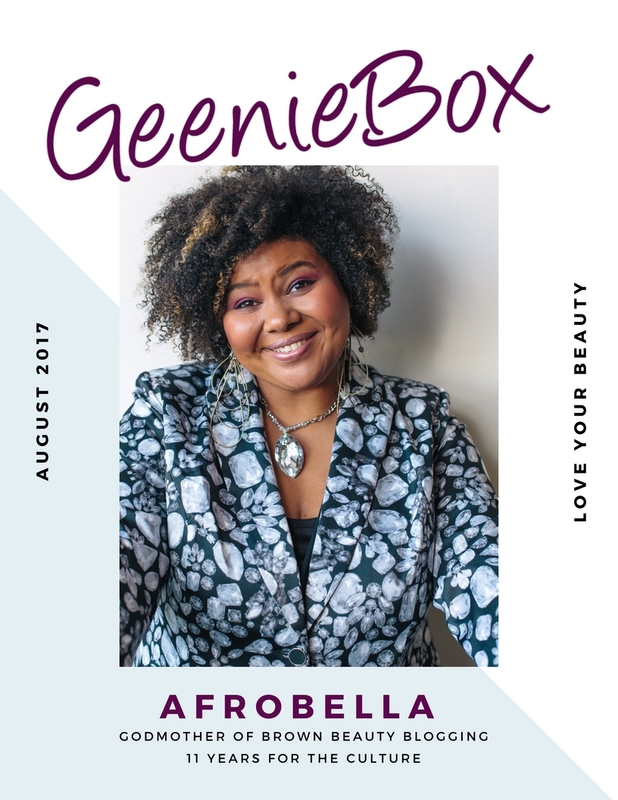 “GeenieBox is where Black women connect to celebrate, refuel and power up. A bunch of women I respect tremendously have been previous Geenies — the list is truly inspiring and keeps growing! I love the concept that includes room for self care and self improvement, and most importantly, gives back. That’s truly what pulled me in. So this August I’m celebrating 11 years of beauty blogging. SO much has changed in beauty, and I am more inspired than ever by the diversity in the space. On the occasion of my bloggaversary, I’m excited to share that I have partnered with GeenieBox to deliver an anniversary box! This special edition GeenieBox will feature a few of my favorite brand partners through the years, a book that has inspired me (and continues to inspire me) and a uniquely Chicago experience! Through GeenieBox‘s “give forward,” we also have the opportunity to give back to a charity of my choice, and I chose the under resourced girls and boys in Chicago. Partial proceeds from the sale of my box will go to Mercy Home, a Chicago-based charity that impacts the lives of young people by providing critical housing and resources. I have visited Mercy Home in the past and spent time with some of these girls and their stories of resilience and survival are truly incredible and touching — you can check them out and learn what they do by clicking right here. Sales for my GeenieBox are open NOW and will close Labor Day. The box will ship by the first week of October. My box is a limited edition one, so grab one now while you can! You can click to purchase here: bit.ly/gbafrobella. And click here to learn more about GeenieBox and Mercy Home. Wonderful concept, great move for charity and an excellent way to celebrate your blog’s anniversary. so love subscription boxes well done! Congratulations on celebrating 11 years of blogging. That’s amazing! Love the subscription boxes and the fact it contributes to charity is even better! Wow, what a great initiative! Subscriptions boxes have been such a massively growing trend, so it’s really great that GeenieBox is riding that trend, but doing more but empowering black women and connecting with charities that influencers are genuinely passionate about. Thank you so much for sharing about this. I’m from Concealer for the Concealed, a social media campaign that advocates for greater diversity in the makeup industry, and so hearing such initiatives makes my heart warm. Please do check us out on our blog, https://concealerfortheconcealed.wordpress.com/ or on our Facebook page, https://www.facebook.com/Concealerfortheconcealed/! And finally, congratulations on the anniversary of your blog! Love what you’re doing, keep at it!